WEST WINDSOR – WWFM The Classical Network, located on the campus of Mercer County Community College (MCCC), is pleased to announce the launch of Well-Tempered Baroque, a one-hour program devoted to the music of the Baroque era. The show will be hosted by Dr. Lewis R. Baratz, an adjunct professor of music at MCCC, and is designed to both educate and entertain, focusing each week on a particular topic and exploring the music and performers of music written from approximately 1600 to 1750. Some of the highlighted themes in the first few weeks of the show include "Birth of the Baroque," which explores the early Baroque movement, and episodes devoted to the music of John Playford, women composers and music in the circle of Thomas Gainsborough. Dr. Lewis R. Baratz, host of "Well-Tempered Baroque" on WWFM The Classical Network. "Most music lovers know Handel's Messiah and Vivaldi's Four Seasons, but Well-Tempered Baroque will take the listener to new frontiers, exploring the social and cultural factors at the very beginning of the Baroque, introduce women composers, and visit with Jewish composers, Louis XIV's musicians; and new world composers active from 1600 to 1750," Baratz said. "My goal is to share my passion and knowledge as a musician and music historian in an entertaining and informative approach." Well-Tempered Baroque will air on Fridays at 11 p.m. beginning Jan. 2, with a repeat Mondays at 2 p.m. After broadcast, the shows can be found at the station’s webcast archive at wwfm.org. Baratz earned his PhD in musicology at Case Western Reserve University and has performance degrees from SUNY Buffalo and Southern Methodist University. In addition to leading the period-instrument group La Fiocco as artistic director, he has performed with Ars Musica, MidAtlantic Opera Company, New Brunswick Chamber Orchestra, Bethlehem Baroque, Biber Baroque, Le Triomphe de l’amour, Vox Ama Deus, PA Sinfonia, Ensemble Impromptu, Virtuosi de seicento, and VOICES as harpsichordist, recorder player and consultant. He is the author of more than 20 articles on a range of topics, including 15th century dance music and 17th century Roman keyboard music, and he has contributed more than a dozen entries to the New Grove Dictionary of Music. Baratz was a Fulbright Scholar and Fellow of the Belgian American Educational Foundation, and currently serves as a board member of Early Music America. 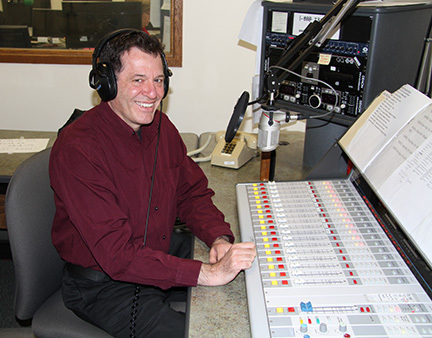 The Classical Network, operating from MCCC’s West Windsor Campus, is a full-time classical music network serving New York City, New Jersey, Philadelphia, eastern Pennsylvania and portions of Delaware and Maryland, as well as reaching listeners in Colorado via satellite and around the world through streaming on wwfm.org. In the fall of 2008, the station launched JazzOn2, a 24-hour jazz station available on its HD channel 2 and JazzOn2.org. The station was the recipient of the 2014 ASCAP Foundation Deems Taylor/Virgil Thomson Radio Broadcast Award. More information is available at (609) 587-8989 or info@wwfm.org.